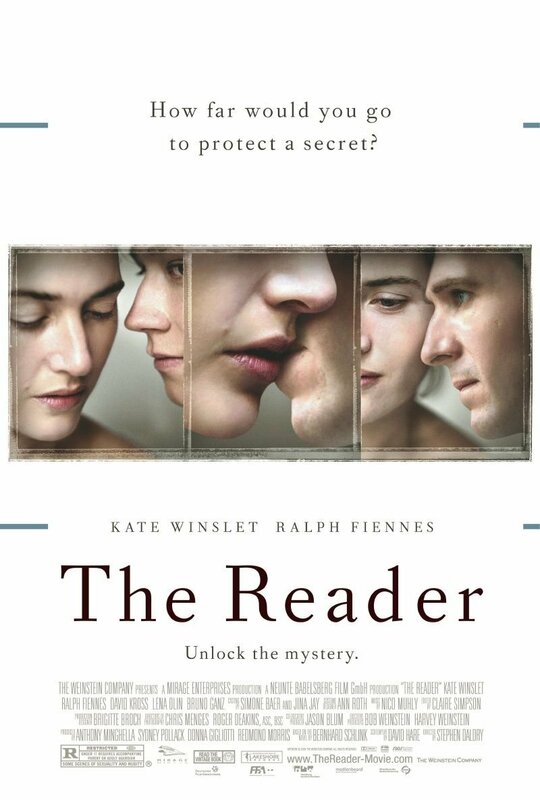 The Reader has had quite a few different posters, but most focus on some variation of Ralph and Kate sharing something. The above variation is my favorite because of the way it combines the most interesting elements of the other posters into one nice package. It is basically a classic “very serious movie” poster. The white background, the polished photos of the stars, the carefully crafted borders and lines, they all scream serious grown up drama. Which is what the marketing campaign was ultimately trying to sell, both to the public in general and to the Academy, or at least that is what it seems. There is also, it’s true, a soft touch in there, a hint of romance. But that is very compatible with the serious drama sell, or at least with this particular iteration of it. After all true love, and that means not the adolescent type, is one of the weightier, more essential subjects grown-ups have to deal with. It’s not a bold poster. It’s not a widely creative poster. But I appreciate its solid execution. Hi there, I found your blog by the use of Google whilst searching for a related matter, your web site got here up, it seems great. I’ve bookmarked it in my google bookmarks.